That’s the case at Cincinnati Incorporated. We’ve long relied on additive manufacturing with BAAM to aid some of our processes, and today, we’ll talk a bit about the fixtures and furniture we 3D print. Up first: pallets and fixtures. 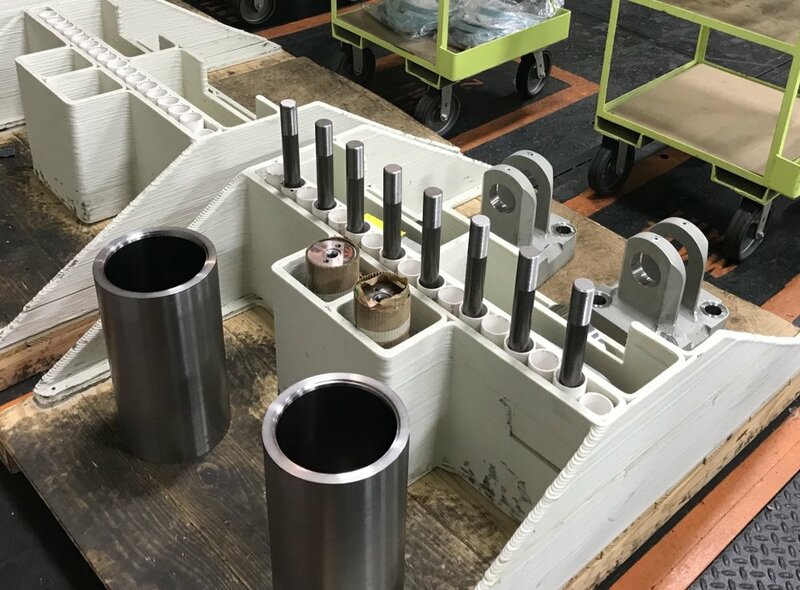 To get the backstory, we spoke with Rick Neff, Additive Manufacturing Product and Sales Manager at CI. Rick has been with us for over a quarter century, and his expertise is helping to establish the commercialization of large-scale 3D printing. Here at CI, we look at putting together kanban arrangements for JIT Production. When something is empty, it gets filled. That made us consider how we put together the cylinder kits for our press brakes. We custom-made pallets with spaces for each part in the assembly. We can scan the pallets and easily see if we are short parts. “There’s no sense in working on cylinder assemblies until you have all the pieces,” Rick said. “Say we need a cylinder assembly tomorrow. We can look at the pallet and expedite the missing pieces.” The pallets are a great practical application for BAAM printing. The pieces that attach to a wooden pallet are 3D printed in about an hour. We use ABS plastic with glass fiber reinforcing. On top of its durability, it’s a cost-effective material, roughly $2 per pound. And since we handle all of it ourselves, the entire pallet assembly comes in at around $100. ABS has proven to be tough and capable of taking a beating. It’s the same stuff LEGO blocks and computer cases are made of. Take a tour of the CI showroom and you’ll notice the GOFORM: our tiny-but-mighty press brake for small parts. It has an adjustable work height and doesn’t require anchors, so it fits perfectly with the ever-changing composition of the factory. And if you try out the GOFORM for yourself, you’ll then notice you can actually sit down to run the machine. “That was a fun one,” Rick said. “We sketched and designed a stool, iterated on its height and figured out the right look for it if we paired it with the GOFORM.” The stool has been a welcome respite for operators, and we’ve discussed adding it as an option to the GOFORM so customers can have it right from the start. We can’t say what in-house parts we might produce next with our additive technology. But if history is any indication, it will likely be useful, efficient and born from a sketch.